Sunset over cauliflower on Foster Rd. Looking south off Davis Rd. 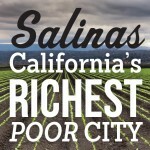 Salinas, California, is a small and densely populated 23 square miles. Some people focus on the city’s crime and housing problems, but Salinas native Juan Govea thinks these people have the wrong idea about his hometown. They need to look around. The city is surrounded by fields and there’s a tight interplay between the city and the natural world. To prove the point, Govea, a teacher at Salinas High School, has been snapping photos with his smartphone all summer break. He posts one a day on Instagram with the hashtag #salinasisbeautiful. He captured stunning birds of paradise in a courtyard at the courthouse, the sun setting over a field of cauliflower on Foster Road, the landscape along California Highway 68 (which connects Salinas and Monterey), the vista looking south off Davis Road, and Bataan Memorial Park. He also took photos out on the trails that are so much a part of what it means to be in Salinas. Here are some highlights from Govea’s photography of Salinas and nature. (For his look at striking buildings and architectural details in Salinas, see this gallery).